You have to define what you want to do, who you want to become and what’s important in life. It will help you to achieve your life dreams. Life is change and we cannot hold on to things, we got to keep moving with the flow of life. If you resist change, you either feel stuck and don’t know what to do next or you get depressed. To make a vision board is a fun, creative, non threatening way to get out of the stuckness into some kind of action and have fun. Creative fun and playtime is something that needs to be incorporated into our lives and unfortunately it's the last thing we allow ourselves. We must make it a priority! Our spirit is playful and needs time to play, otherwise it will rebel and sabotage us. So do yourself a favor and bring more playtime into your life. Yes I know it’s hard to do, but it's something that should be part of the daily routine. Journaling will help you to contemplate and define your dreams. This is a right brain activity, so don’t make it intellectual, just go through and stash all the pages in a box. When you have a good selection of pages go through all of them and pick out the ones that fit your theme. you can sort them by color and categories. You can make a theme vision board, like career, health and fitness, relation ship, or you can do for several themes, which is a life vision board. One other way to do it, is to divide it into 4 areas, based on feng shui. I normally glue a happy, healthy, confident picture of myself smack in the center. If you choose to do it this way, arrange the images area by area. You can also create a layered vision board, it’s a bit more complicated but it’s worth it because it’s like a piece of art. So try and don’t forget to have fun with it. What do you like about vision boards? Again, another item on my list to accomplish in the 1st quarter of 2014! Love the idea of vision boards because of the creativity it brings about. As an accountant by profession, I can only be but so creative with numbers, but a vision board allows you to dream and see how your life can change! Thank you for inspiring me, Marita! I agree! The more you make something "real" and possible in your life, the closer it becomes to being a possibility and your brian just starts to work for it! Vision boards do make you feel great! I've even surfed the internet for great pictures and cut them out and pasted them! OR did a graphic collage online and printed it out and hole punched them for pages of dream building/dream board! As a visual person, I love the idea of a vision board. It takes things out of our mind's eye and put them in front of our real eyes. I haven't done one in a long while, but there's not time like the present to get started. Thanks for the push! I’ve been implementing Feng Shui into our house too and it really does make a difference. Right now I have a cork board with cut outs, but I haven’t been updating it and didn’t put the small things so I could celebrate the small victories. Definitely need to do that for my 2014 one. I’m using a vision board to help me stay on task with the goals I plan for 2014. I love my vision board! I’ve used them for years. It’s fun to look back on the old one and see how many things I got or accomplished. I put a gold star next to items I get. This was interesting, never really thought about a vision board, nor do I think I have heard of it before. Great idea. We too often think of the negative, this way it helps remind us of the good things in our life! I just love vision boards. Not only does it give me images of my goals but it allows me to use my creative side. This year I have done a vision board in an Origami Owl locket so that I can take it with me everywhere. Will be doing this right after the holidays! Looking forward to great things in 2014! what a neat coincidence that I’m reading your vision board post right after Holly’s goal setting post. They go hand in hand! My buddy has taken vision boards to another level. She now creates a vision calendar! I’ll be working on this and will let you know how it goes! One thing I keep telling myself I will do but never quite get it done is my vision board. Really need to just sit down and do it one day. I even know a lot of what I want there. I have always wanted to create a vision board! Thanks for the great how-to! I love this article mainly because I love vision boards! I have a few that I created on my computer and I use them as my desktops. 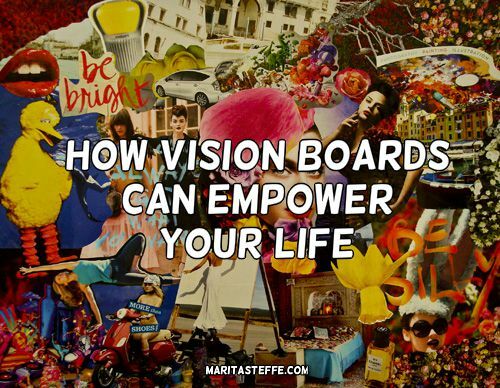 What cool things do you currently have on your vision board Marita? I have to make a new one, Hopefully I’ll get to it next week. Rigth now I stay with my parents and it’s difficult to do projects. But I know what I want on it: Manifest a great positive community of women in Germany, Walk the Camino, move more into my center, find a spiritual community. Create a great supportive space to work and be happy! This is probably not all………….. Interesting idea! Vision boards are a great way indeed to motivate you to reach your goals. What do you think is the greatest thing you have achieved in life so far?